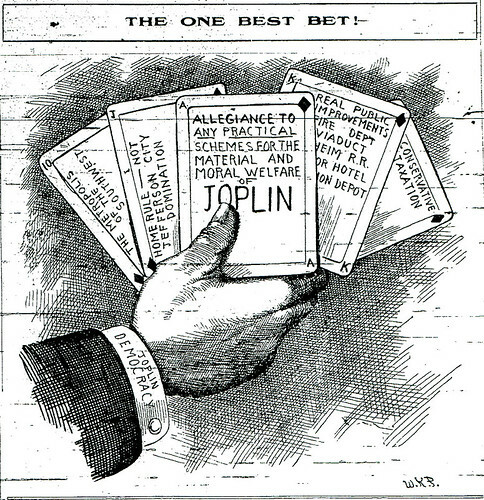 The city of Joplin came into existence in 1873. Since that time period, there have been a number of mayors. Below is our attempt to slowly build up a convenient list of Joplin’s early leaders. Eventually, each mayor will also have their own post which will offer more detailed information about these early leaders and the roles they played in the city’s development. If you have photographs of the above listed men or documents connected to them, we’d love to share them here on Historic Joplin. 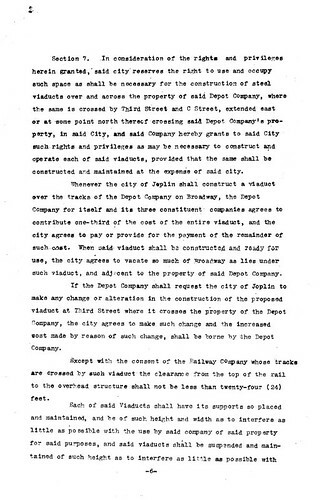 Our first installment of a history of the Joplin Union Depot covered the contentious debate between those for and against a franchise agreement offered by the Joplin Union Depot Company. Now we return to Mayor Jesse Osborne’s approval of the franchise and the long wait between approval and the start of construction. 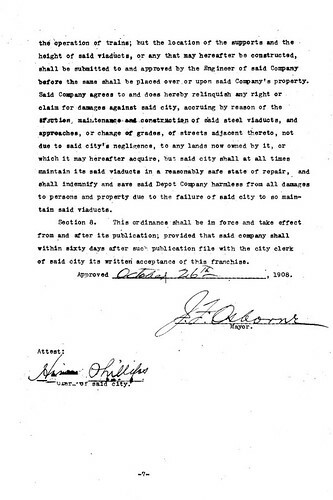 On October 26, 1908, Mayor Osborne signed the franchise agreement after the City Council passed it with nearly a unanimous vote. 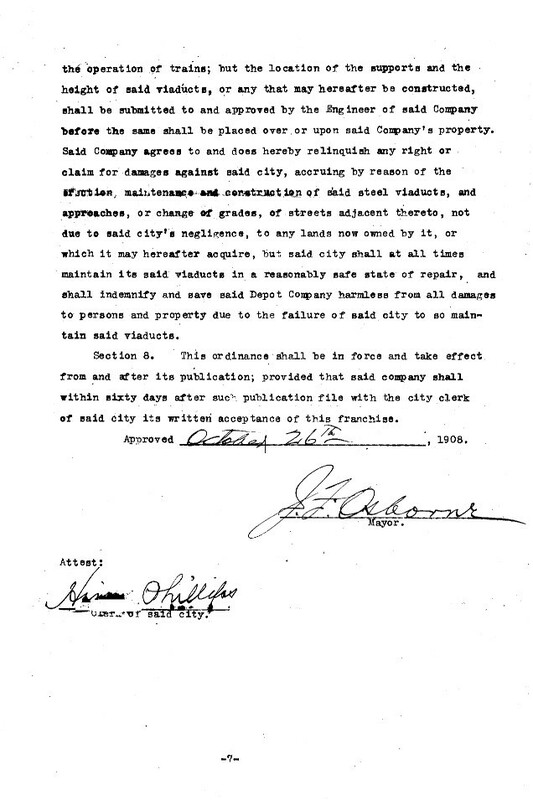 Osborne’s approval was definitely made more likely when City Engineer J.B. Hodgdon returned from a trip to Kansas City two days before with a contract signed by the president of the Kansas City Southern, J.A. 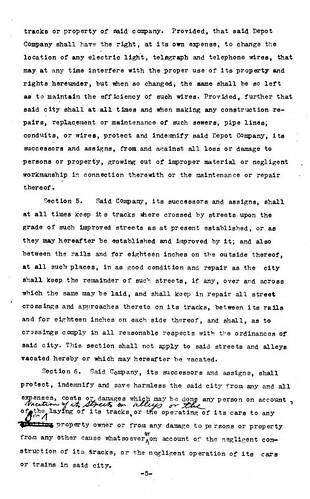 Edson, promising to supply material for 324 feet of a viaduct. 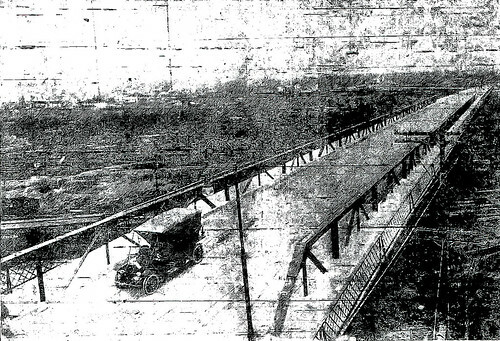 As the Joplin Daily Globe noted, a viaduct was “Joplin’s dream,” for it would connect East Joplin with West Joplin. Despite the union of the two towns of Murphysburg and Joplin into one town over thirty years before, there still existed a recognizable separation of the neighborhoods that lay on the west side of the Kansas City Bottoms and those which resided on the east side. The viaduct would help erase these separate identities. Thus, the assistance of the Kansas City Southern provided a great impetus for Osborne to sign the franchise agreement. 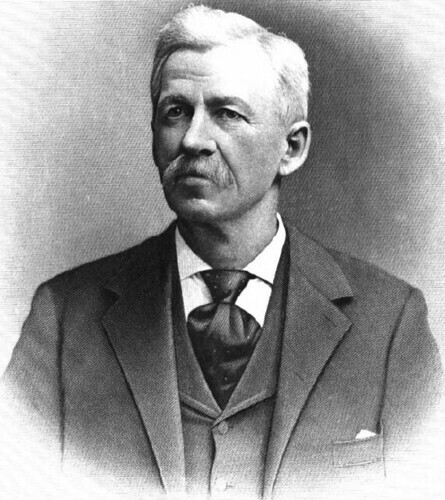 Guy Humes, later mayor of Joplin, but fierce opponent to the depot franchise passed by the City Council. 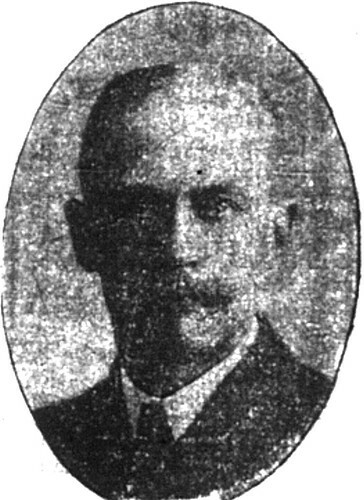 After the council had voted, but before Osborne had signed, the Joplin News Herald, one of the opponents to the franchise, went so far as to dedicate multiple columns to local attorney, Arthur E. Spencer, who claimed that the reaction of the Commercial Club (also an opponent to the franchise) was a reasonable one. Among the arguments Spencer relied upon was an existing franchise agreement which did not have such a contested “reasonable facilities” clause. (See our prior post for more information on that clause). For all the noise that the opponents of the franchise created, it was not enough. “Every such accession makes for bigger values within the city of today, and makes for a bigger city of tomorrow,” stated Mayor Osborne upon signing the franchise. The signing occurred despite a planned mass rally by Clay Gregory, the secretary of the Commercial Club. The rally, reported the Globe, was called off when Gregory was chastised by two other members of the club. It was the end of the opposition to the depot franchise. What followed may be construed as a big wait. 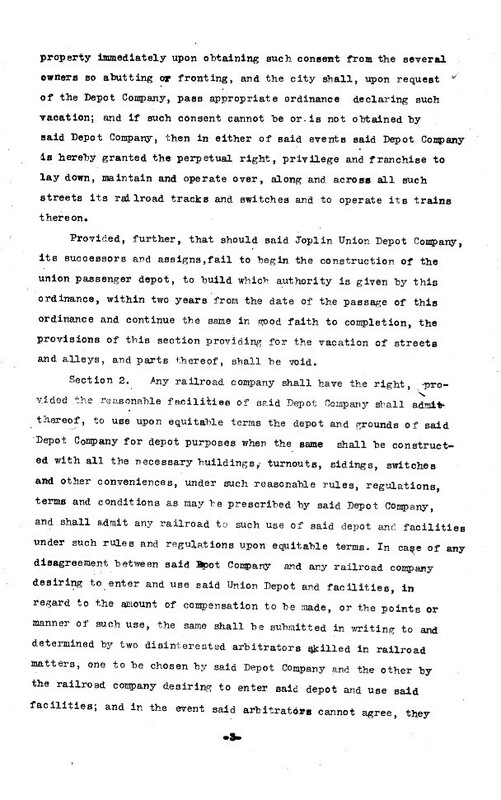 This Joplin Globe article noted the exasperation that many felt with the opposition to the depot franchise, including that from the much maligned Clay Gregory, Secretary of the Commercial Club. 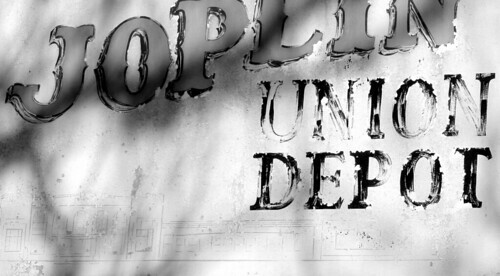 News of the Union Depot virtually fell out of the headlines of both Joplin newspapers until a front page headline nearly five months after Osborne’s approval of the franchise. “WILL BEGIN WORK UPON UNION DEPOT WITHIN 30 DAYS, DECLARES EDSON,” announced the Globe. 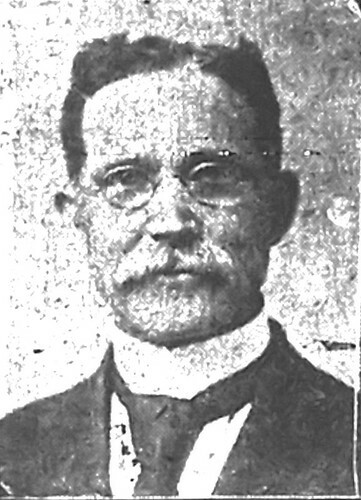 The news came from Gilbert Barbee, a Democratic political power in Joplin, as well editor and owner of the Joplin Globe, who had traveled to Kansas City and claimed to have spoken with the Kansas City Southern president, Edson. The claim initiated a brief spat between the Globe and the News Herald, which immediately set out to prove its rival wrong. 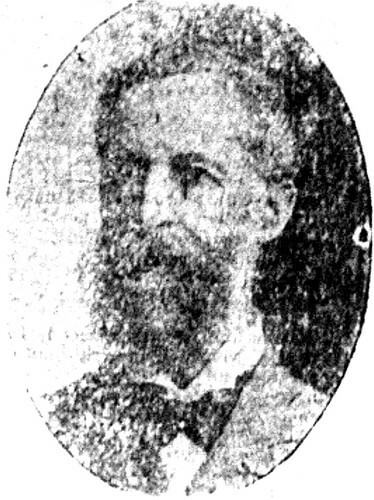 An editorial, published in the Globe, on April 4, 1909, summed up the dispute, which involved the News Herald sending its city editor to Kansas City to find contrary evidence to the news brought by Barbee. The Globe then charged that the News Herald was and had remained opposed to the Union Depot for two damning reasons. 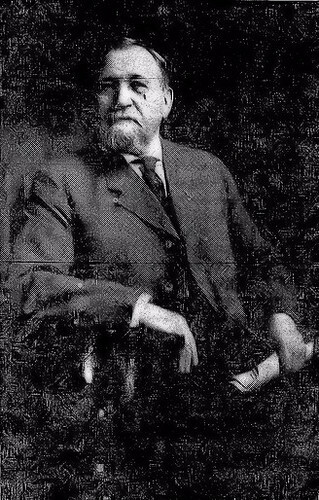 The first, that the newspaper wanted to “get on the roll” of James Campbell, whom the Globe labeled Joplin’s largest landowner and perhaps, Missouri’s richest man (and a large shareholder of the St. Louis & San Francisco “Frisco” Railroad). 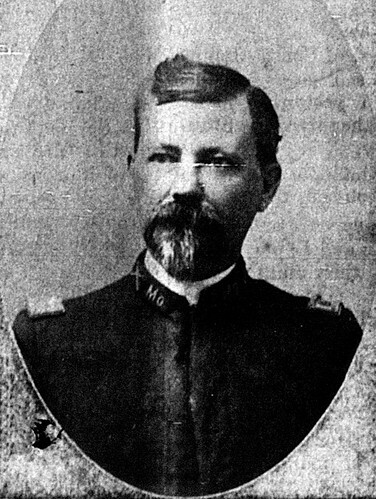 Campbell had been labeled an opponent to the Union Depot project because he wanted to establish a new Frisco depot, which would be in competition with the other depot. 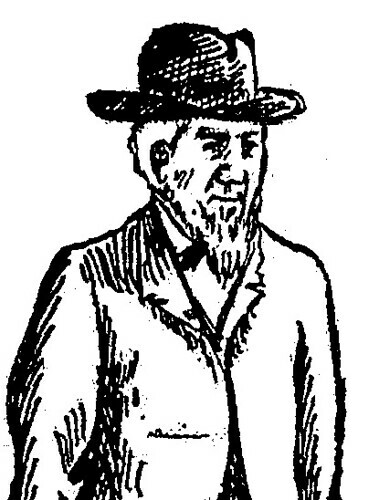 The second charge was that the individual who controlled the News Herald, unnamed by the Globe, but perhaps P.E. 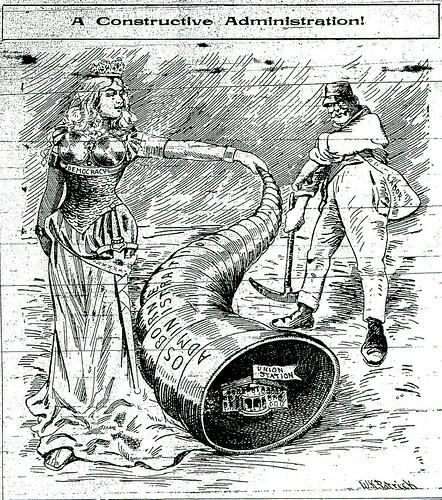 Burton, was actually a resident of Springfield and purposely used the “evening paper” as a means to vocalize against any improvement to Joplin. More so then than today, Springfield and Joplin were rivals, each competing to become the larger metropolis in Southwest Missouri. It was not beyond the vitriol of either populace to accuse the other of undermining their interests. For all that the Globe had knocked its competitor for trying to undermine its claim, construction of the actual depot was still very far off. 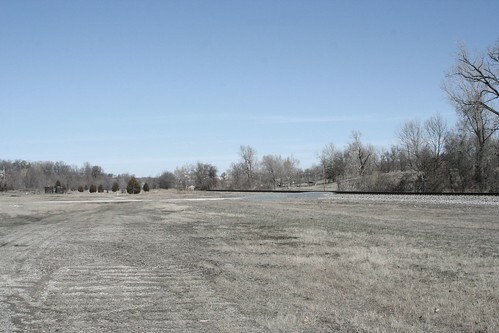 However, preliminary work to prepare the Kansas City Bottoms was underway by late April. 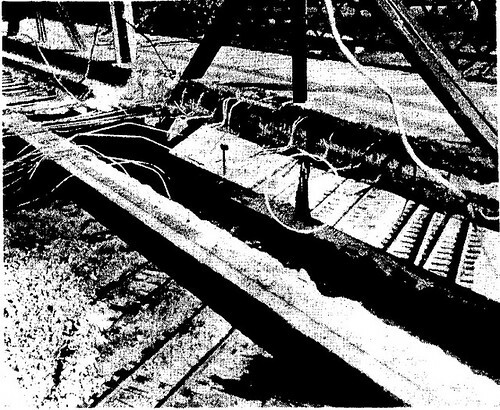 One of the tasks deemed essential to a successful construction was the taming of the branch of the Joplin Creek which ran back and forth along the Bottoms. The creek, one of the barriers that separated the east and west parts of the town, had a reputation for flooding the Bottoms after intense rains. 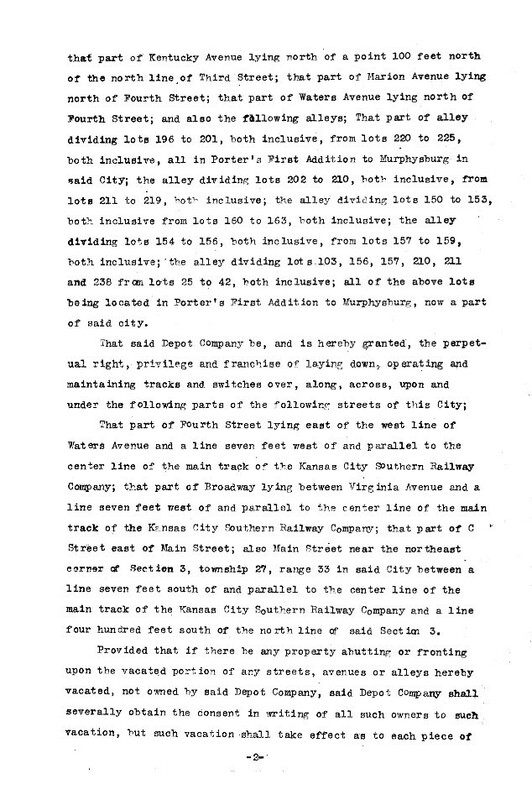 A representative from the Kansas City Southern was assigned the task of getting the permission of those who owned land (not owned by the Union Depot company) upon which the creek ran to change its course. The plan was to straighten the creek along the bluff near Main Street. By the time the representative departed, permission had been secured. As a trip to the former Kansas City Bottoms today will attest, the plan was well carried out. It was a belief, at least of the editors of the Joplin Globe, that Springfield actively sought to keep its rival Joplin from benefiting from any improvement which might make it more of a competitor. The anticipation continued, however, as Joplin awaited news of the start of construction. 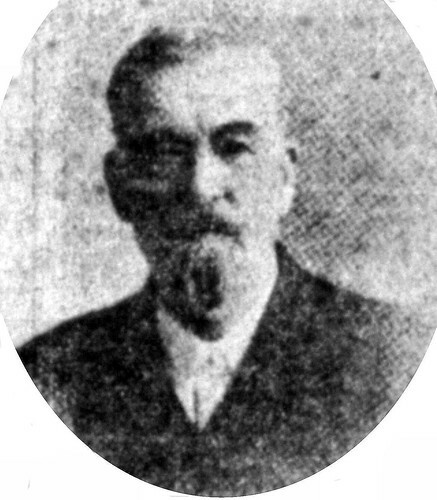 In May, 1909, former Missouri governor, David R. Francis, an investor in the depot, along with other investors, visited Joplin. 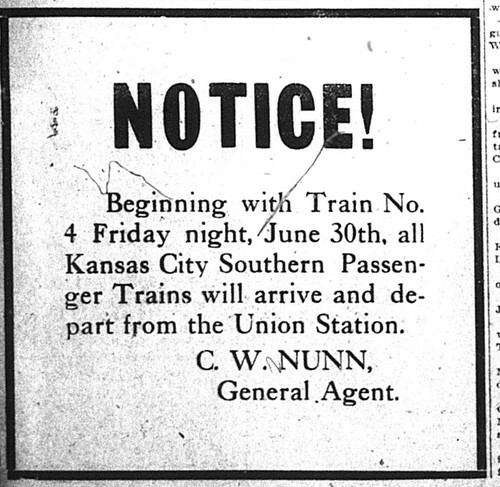 The former governor reassured the locals, and commented, “Plans for the depot are well in hand and arrangements are practically completed for work to begin soon.” News on the depot, however, was scarce until August, when it was announced that the Missouri, Kansas & Texas Railroad, also known as the “Katy,” had agreed to join the Union Depot company. This brought the number of railroads affiliated through the company to four: Kansas City Southern, Santa Fe, and Missouri & Northern Arkansas railroads, in addition to the Katy. Additional news was the appropriation by the company of $200,000 for the construction of the station. 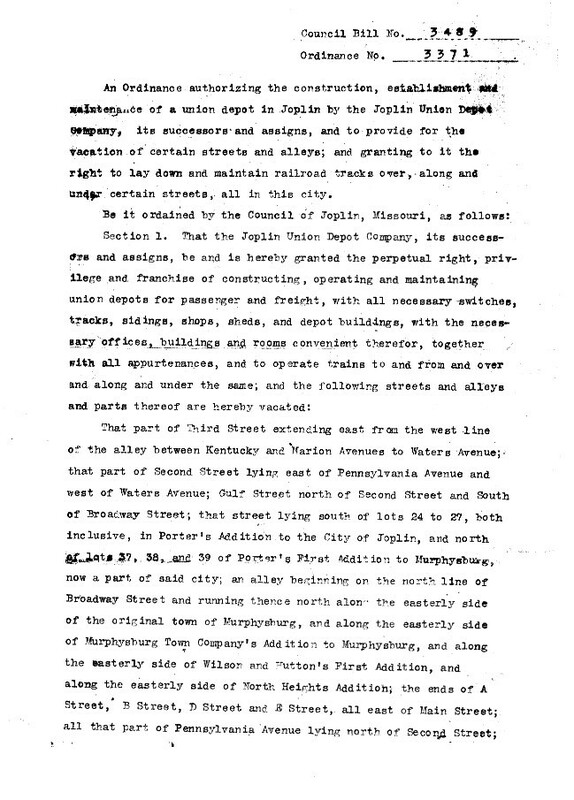 The appropriation came as engineers from the Kansas City Southern, directed by William H. Bush, completed surveys of the depot and station site. 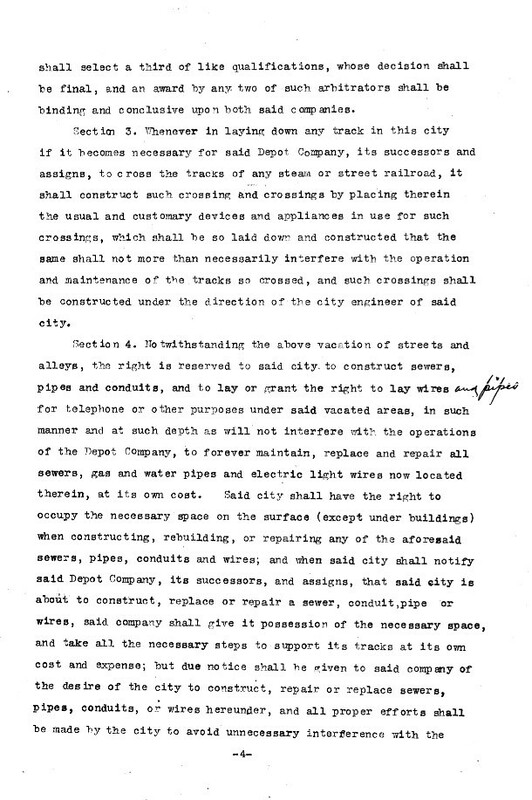 The depot, Bush stated, was planned to be located near Broadway and Main, “situated 200 feet east of Main Street and the south line 150 feet north of Broadway.” When quizzed on the status of the depot, Bush confirmed that the plans and specifications were completed, as well the architectural plans drawn up. In a short time, assured Bush, the company would begin accepting bids from contractors. 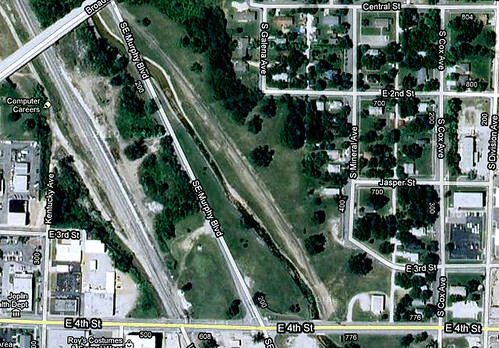 As part of the preparation process, the Kansas City Bottoms would be filled in to make a proper rail yard. As the engineer departed, it seemed that the building of the depot was not far behind. 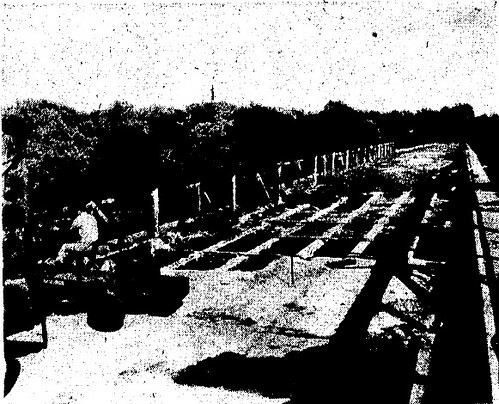 Indeed, not long after, on August 17, engineers from the Katy railroad arrived to survey a spur that would take their railroad to the future depot. Despite the build up, developments of the depot again drifted out of the newspapers. 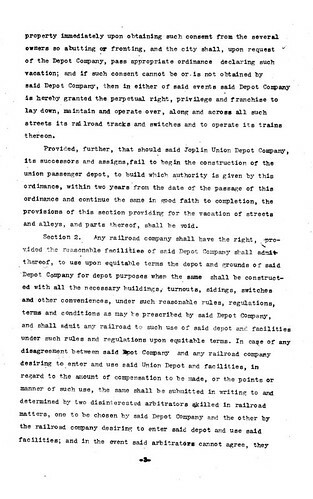 In October, a fifth railroad, the Missouri Pacific railroad, expressed interest in joining the Union Depot company. Then, for the next three months, news about the depot, its impending construction, vanished from the headlines. 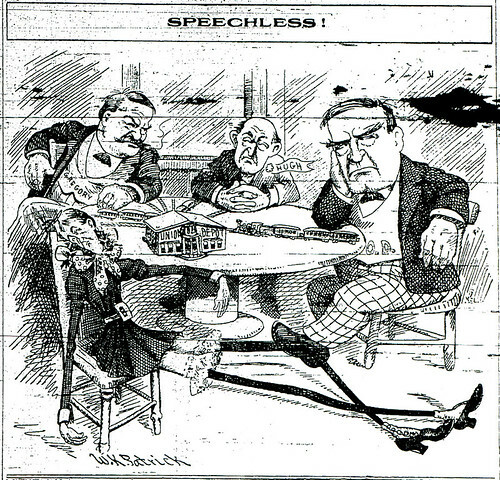 The citizens of Joplin, as the months passed, grew anxious for news about their expected Union Depot, as depicted in this Joplin Globe cartoon. The silence broke on the first day of February, with the News Herald taking its turn to offer a reported start time from a traveler to Kansas City. The news came from a former Joplin resident, H.H. 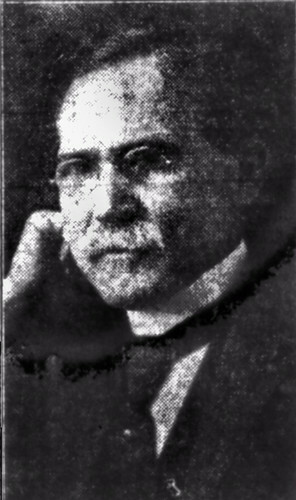 Haven, who passed on “reliable information” that work would begin soon. The paper, which noted the long wait by beginning its article, “After months of inactivity…,” brought forward the news that the cost of the depot construction had grown to anywhere from half a million to 700,000 dollars. The station, itself, the paper noted was still expected to be about $40,000. This figure was quickly upended by a report a few days later, based on information from the city engineer, Hodgdon, who was being tasked with overseeing the depot construction. 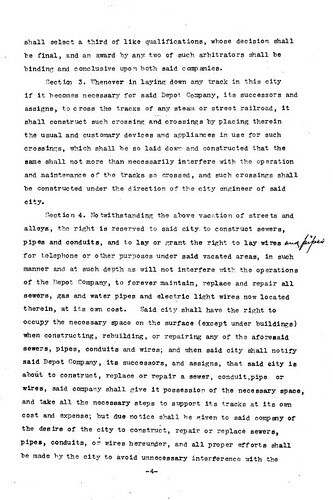 The signing of the depot franchise was considered a major victory for the administration of Mayor Jesse Osborne. Furthermore, it was viewed as victory for democracy. 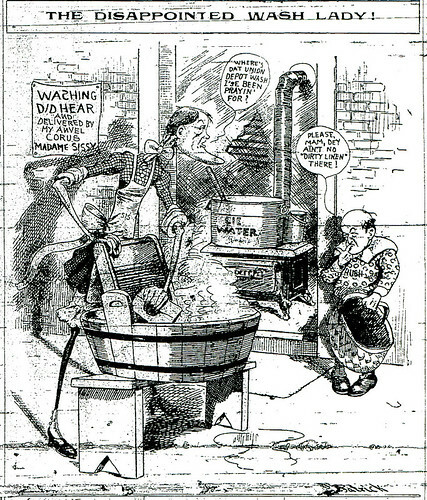 Note that Joplin here, unlike other political cartoons, is depicted as a miner. 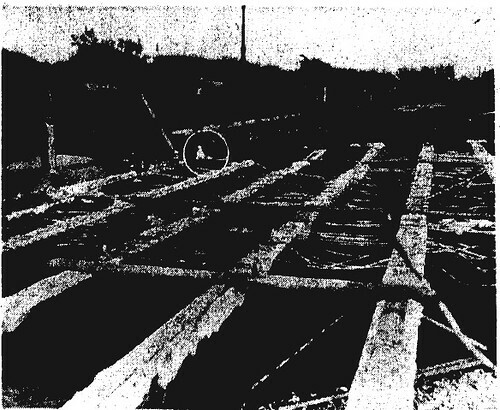 Perhaps the most accurate timeline yet for depot construction was presented with the grading alone, which was to cost at least $50,000, to take at least eight months to complete. The magnitude of the grading problem was made evident with the expectation that in some places, depths of as much six feet would need to be filled in. Again, the overall cost of the depot was raised, now to an estimated million dollars. 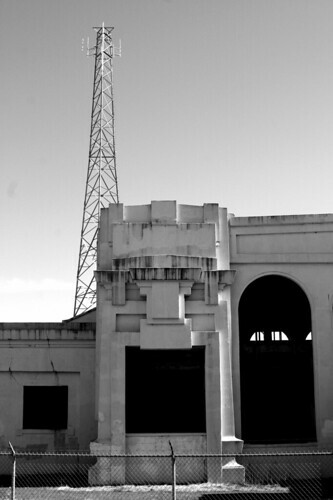 The actual station and train sheds were expected to be finished by January 1, 1911. While the million dollar price tag was impressive, the Connor Hotel, completed only a couple years earlier, had also a hefty expense. 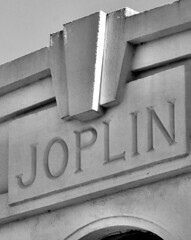 The metropolitan Joplinites were growing use to expensive additions to their city. The achievement of the union depot was seen as one of the top achievements by Joplin democracy, whereas the will of the people triumphed over the opposition of a well-funded minority opposition. It's presence was ranked with the Connor Hotel, the fantastic automotive fire department, and other improvements. 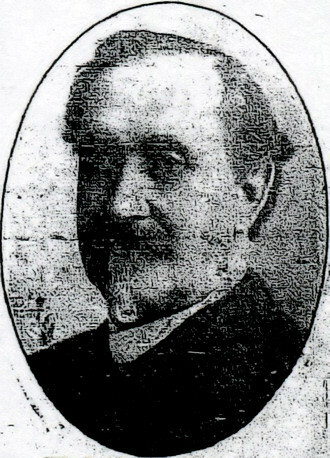 The piece was divided between praise for the reassurance brought by the sale of the bonds, and in typical inter-paper rivalry, prods at those who opposed the depot franchise, such as the News Herald. 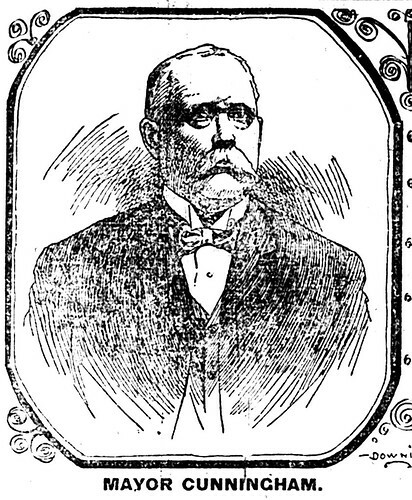 In an earlier piece, the Globe had noted of James Campbell, the Frisco owner, that it would support Campbell in any quest to build a new Frisco depot in Joplin (rumors of which were plenty). 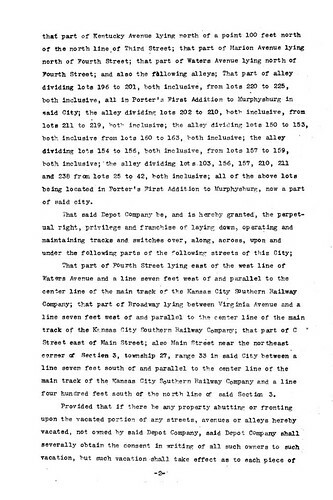 However, as victory was indeed within grasp, the paper took time to lambaste the current Frisco depot located at 6th Street in scathing terms, “One of the very prompt results of this Union Depot will be the passing of the imposition at Sixth street which the Frisco still presumes to call a depot. 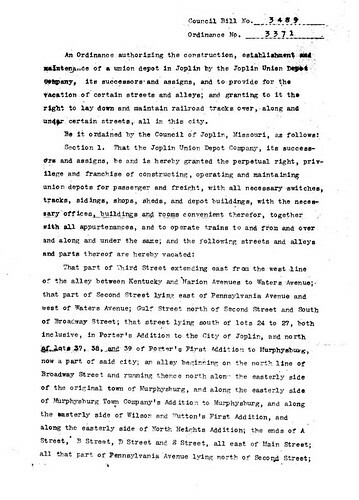 We have been told with the pathetic trembling of lips that grieved at the confession of helplessness, that the sodden, barbarous inadequacy at Sixth street was permitted to remain because the Frisco didn’t have the money to build a better depot.” More over, the Globe refused to accept “manifestly false absurdities,” and pointed to the millions spent by the railroad on its facilities in nearby Springfield. In the haze of victory, with no little forgiveness for those who opposed the depot, the newspaper helped voice the frustration of a city impatient to continue its climb to greatness. 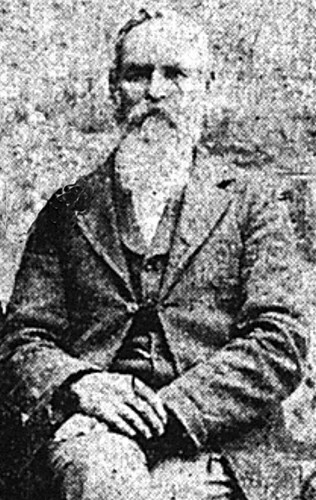 Two days later, the man who had helped to personally usher the franchise which bore his name, John Scullin, arrived in Joplin. 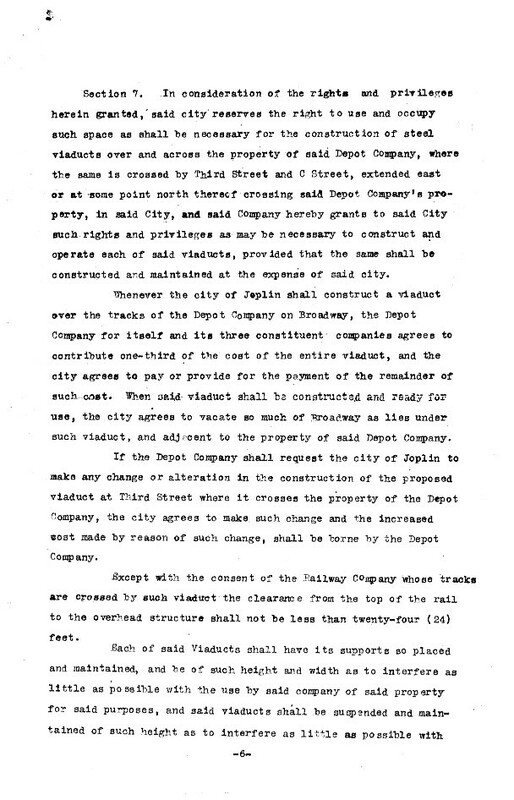 The agent of the Joplin Union Depot company recounted the delays which the company had encountered due to the opposition of what Scullin described as a “faction who handicapped the initial steps for the erection of a station.” None the less, Scullin acknowledged that wiser heads prevailed, and promised the station would be completed by January 1, 1911. 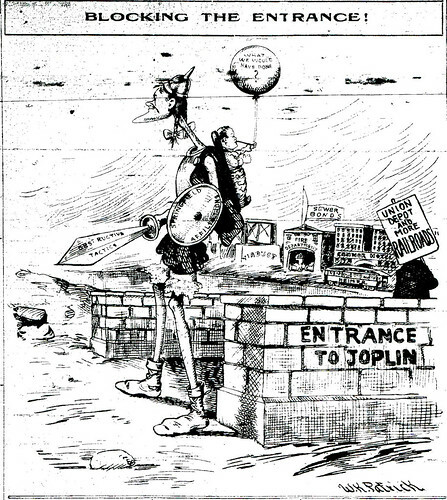 On March 1, 1910, the people of Joplin were offered their first glimpse of their future union depot. Printed prominently across the top of the front page of the News Herald was an architect’s rendering of the front of the station. 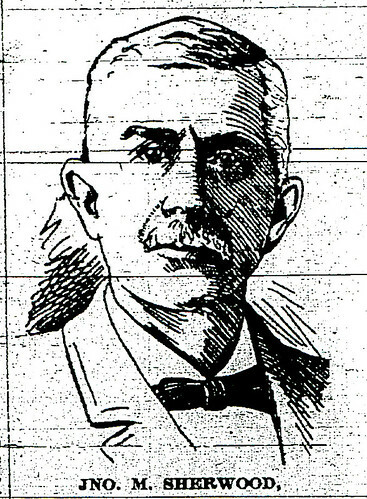 Kansas City Southern chief engineer, A.F. Rust, introduced the building, “Louis Curtiss of Kansas City is the architect of the depot and we believe he has done well. As you may notice, the middle section of the building is two stories high and on the second floor will be the offices. At the right will be the baggage and express offices, while the east end will be occupied by the restaurant.” Rust went on to add of the station, “The construction will be of concrete faced with stone. Title will play a prominent part in the interior decorations, the mission effect being carried out in a happy fashion. Entrance to the station from the rear will be from Main by a driveway that will circle at the back away from the trains.” Rust finished his appraisal of the station with yet one more proposed cost for the station at $75,000. The city now knew what to dream of, when it waited in anticipation for construction to begin and for what it hoped to be a boastful addition to their home at the start of the next year. Between then and the station’s opening, a long road yet remained to be traveled. Earlier this week, we brought you the heated debate that surrounded the passage of the Union Depot franchise, also known as the Scullin franchise. For those of you who’d like to see the elephant, rather than hear about its parts, we now provide you scans of the original franchise. Click on the images to be taken to a flickr page where you can read them far more comfortably! [Then click “back” on your browser to return here.] Thank you to those who helped us in getting a copy! 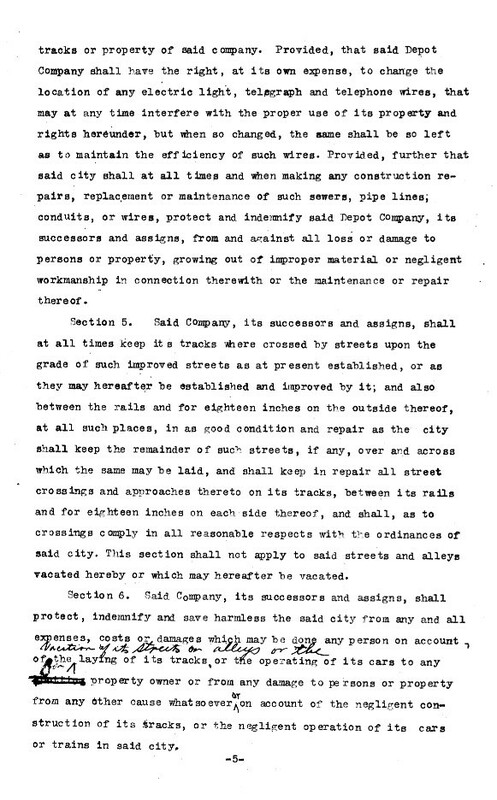 Page 3 - contains the perpetuity clause, the 2 year construction clause, and the controversial facilities clause. 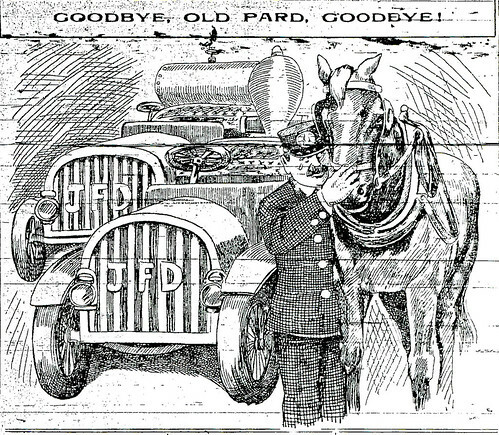 In our earlier coverage of the origin of the Joplin Fire Department, we concluded with the transition by the department from horse drawn fighting apparatus to fire fighting equipment mounted on automobiles. This transition did not occur without fanfare or no little publicity. The Joplin Fire Department received an overwhelming response to the tournament invitation. 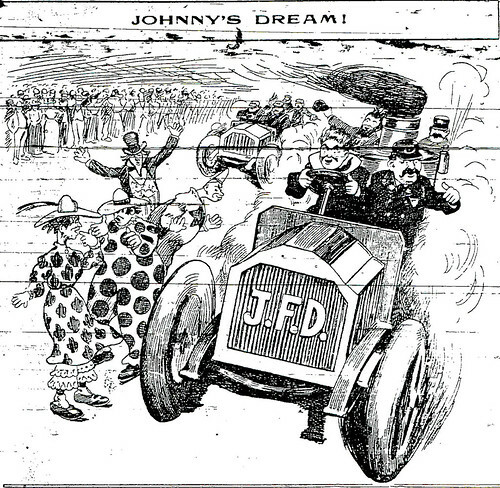 A cartoon depiction of fire engines racing around the Barbee track! Not to be forgotten were the fire horses, who had there own races as well. The horses, still retained by the Joplin department, would have a chance to race against those from other departments before literally being put out to pasture. The big horses which had the hard task of pulling the fire wagons through the streets of Joplin at breakneck speeds, had one last opportunity to demonstrate their ability. On September 8, 1908, the first day of meeting of the Southwest Fire Association began on a Tuesday morning with the business meeting of the association at the Commercial Club. Mayor Jesse Osborne enthusiastically greeted the firemen, “Joplin wants you to have a good time. The city is thrown wide open to you and if you see anything which you want that is tied down, tear it loose.” Speakers included an invocation by Reverend W.F. 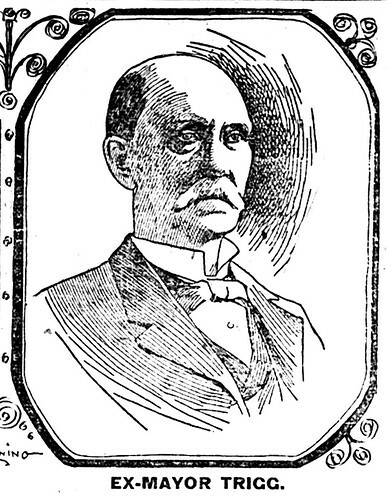 Turner, the president of the Commercial Club Col. H.B. 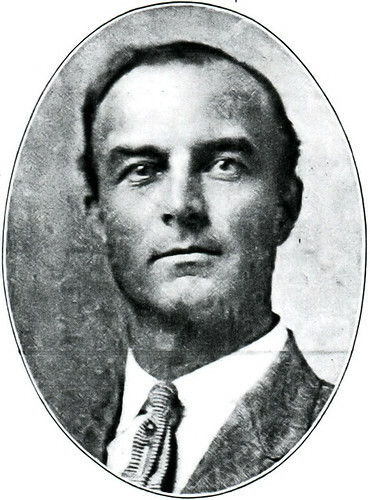 Marchbank, as well as two past presidents of the association, and the current president from Neosho, Missouri, Jonathon M. Sherwood. Present at the meeting were 25 delegations from the four states, who opted to adjourn at 10 am. The afternoon must have been a delight to small boys and girls who crowded Main Street and the other streets along the parade route to witness a mile long parade of firemen and their fire fighting apparatuses. It began at approximately 2:30 pm at the central fire fighting station with the vanguard composed of a handpicked squad of 18 mounted police officers lead by Joplin Police Chief, Joe Meyers and his Assistant Police Chief Cofer. Behind them marched a band, and behind this musical introduction, companies of firemen from Galena, Weir City, Scammon, Gas City, Neosho, Carterville. Veteran firemen of the association followed with veteran Joplin firemen right behind them. These veterans pulled a cart with them, the first piece of fire fighting equipment ever employed by the department. Behind them rode city officials in carriages who were trailed by the four automobile engines of the department, as well four horse drawn engines. Over a thousand visitors, it was estimated, had arrived in Joplin for the tournament. After the parade, crowds gathered at the central fire station to examine the “big machines” which demonstrated their capability and even raced down Main Street in a demonstration and “the speed of the automobiles and the dexterity with which they were handled elicited much applause.” However, the appreciative crowds had to wait until 1pm the next day to see the machines on the race track. 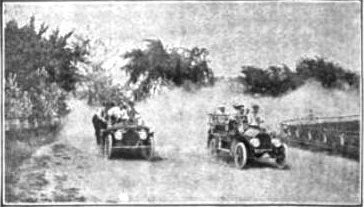 Photograph from 1909 Popular Mechanics of Joplin's fire engines on the racetrack. Wednesday saw the main attractions of the tournament with fire engines raced around Barbee racetrack. Nor were the fire departments ready to forget their fire horses with an exciting race between the Joplin departments taking place. Before an estimated crowd of 3,500, the victor of that narrow contest was Station No. 3 of South Joplin. 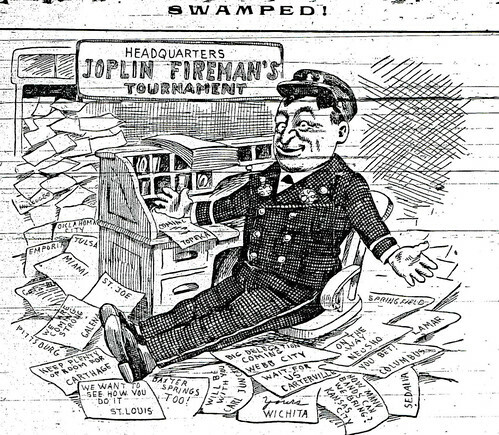 The firemen of South Joplin were pulled to victory by the beloved bay and iron gray fire horses, King and John. They defeated the other Joplin pair of fire horses, Tom and Dan. Other competitions involved laying out 150 feet of hose and then “water thrown” to stop the clock. Specifically, teams had to race to a line, then attach a hose to a hydrant and put a nozzle on the hose. It was the firemen from Carterville who ended up excelling at this contest. Numerous other competitions occurred which revolved around other skills essential to the task of fighting fires. A depiction of moments from mainly Wednesday's activities at the tournament. The final day of the tournament was expected to draw even more to Barbee’s racetrack than the 3,500 from the day before. The main attraction was a real demonstration of firefighting by the Joplin stations. 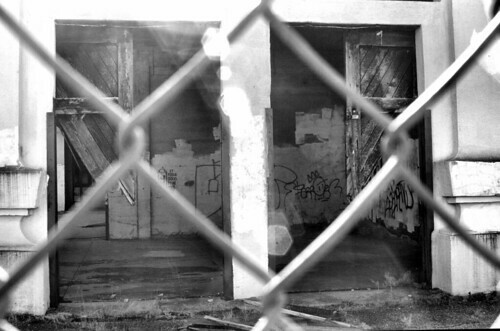 A two story wood structure, doused in oil, was built upon the race grounds and set aflame. 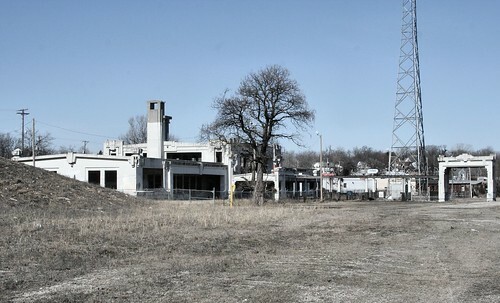 It was decided before hand that the structure would “be allowed to get well under way before the automobiles leave their stations.” Before a crowd of thousands, the Joplin firemen arrived, bells ringing, and extinguished the flames. It was a seminal moment for not just Joplin’s fire department, of which the city and its residents intensely proud, but also for fire fighting across the nation. It represented the beginning of the end of the fire horse and the introduction of the modern fire engine. 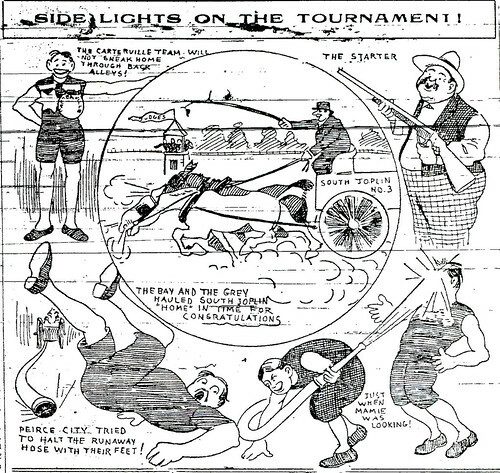 Though, as one editorial cartoon depicted about a week after the tournament, the fire horses, while replaced, were loved and would be missed. A Joplin fireman bids a tearful farewell. This page took 1.158 seconds of computer labor to produce.